This will be something of a bits and bobs post as I am writing it without a theme, just as something to do while I am running various bits of software to extract and verify emails ahead of my first ever email campaign. 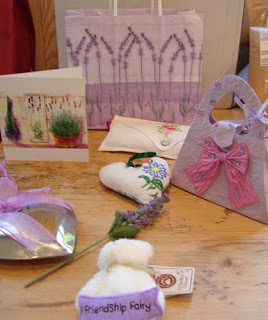 Firstly a very belated but very big thank you to Sue over at A New Life in the Country who very kindly sent me some lavender goodies a few weeks ago when I was lucky enough to win her giveaway. She sent a huge array of lavender themed things which turned my office into a really relaxing and fragrant space for a while. And this is my very favourite - a simple but pretty little lavender filled heart. It is hanging next to me as I type. Thank you so much Sue. And for anyone who has yet to discover her blog do go and have a look - it is fascinating stuff. As the the title of her blog suggests Sue really has started a New Life in the Country - growing veggies, raising chickens and attending country markets with her lavender things. It sounds like a dream life doesn't it, and in many ways it is - but I know I couldn't do it. There is hard work outside in the cold and lots of mud. Go and see! It is Friday which means that Isobel will be coming over later - Mike's daughter who lives with us at the weekends. I love this picture of her in my office with Humphrey. And while we're on family photos I kept meaning to post this picture of Mike I took when Ernest the rooster came to stay. 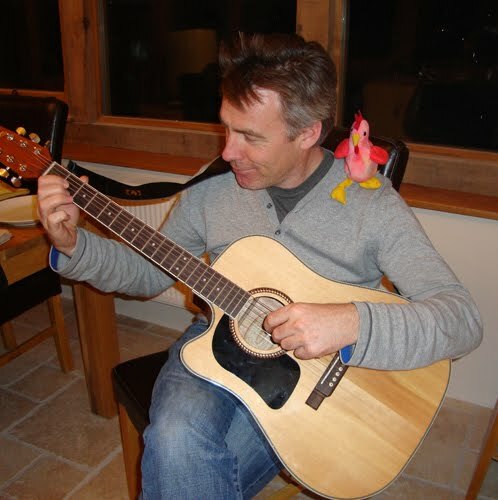 He is probably going to kill me for publishing it (those of you who know Mike will know he is not the sort of man to enjoy being photographed with a soft toy rooster) but I think it's a nice photo! That really is a lovely photo of the two in your office. They both look very happy to be in each other's company. I had some goodies from Sue too. Lovely photos ... & Ernest too- he does get himself really involved doesn't he? I expect a song when he ( finally ) comes home ! We were very lucky & stayed in a friends apartment in the end because it was out of season, but if you aim for somewhere to stay along the paseo/walk way along the beach you should be able to ask if you get the sea views. We were really lucky because our apartment was right at the back of the building hence getting the amazing views. Mike's cute! Humphrey is such a sweet cuddle bunny. 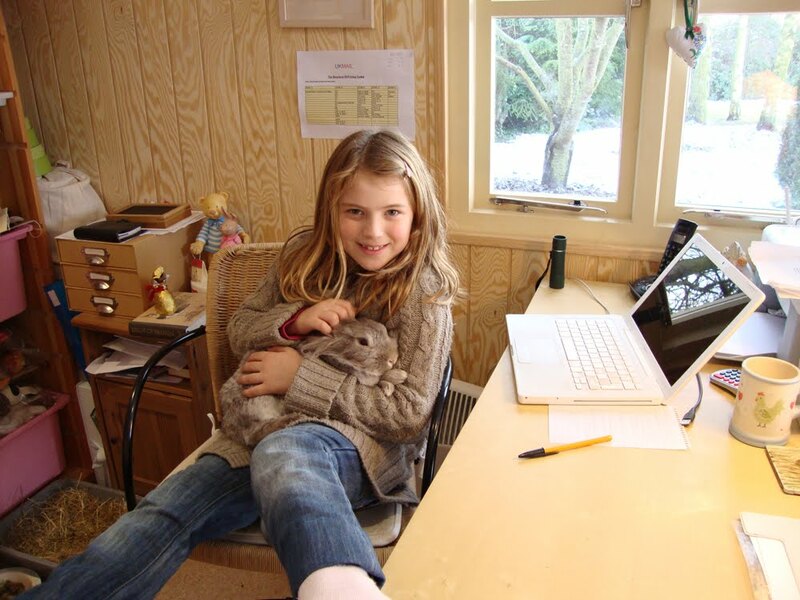 A lovely picture of Isobel and Humphrey together. Very nice goodies you've had! I love lavender. Thanks for your comment on my blog. The slabbed area in our garden is actually for a summerhouse. The question is, what is going in there, not what you'd normally find in a summerhouse. There will be a little prize for the correct guess! what a lovely surprise! congrats! 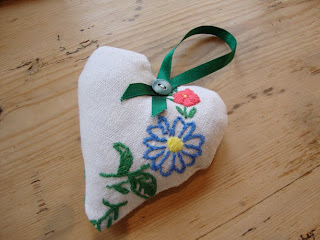 and the heart is gorgeous! Had Humphrey started on his carrot beds yet? I saw in the other post he was getting ready to dig the beds for planting? Humphrey and a traveling rooster make for a pretty good post anytime! Bits and Bobs are good....gives us a behind the scenes glimpse of sorts:D Wishing you and Humphrey a great day.